From GSUTigers.com |GRAMBLING, La. | Shakyla Hill etched her name in the college women’s basketball record books on Saturday afternoon as the Grambling State University women’s basketball team rolled past Arkansas-Pine Bluff, 77-57, in a Southwestern Athletic Conference (SWAC) game at the Fredrick C. Hobdy Assembly Center. 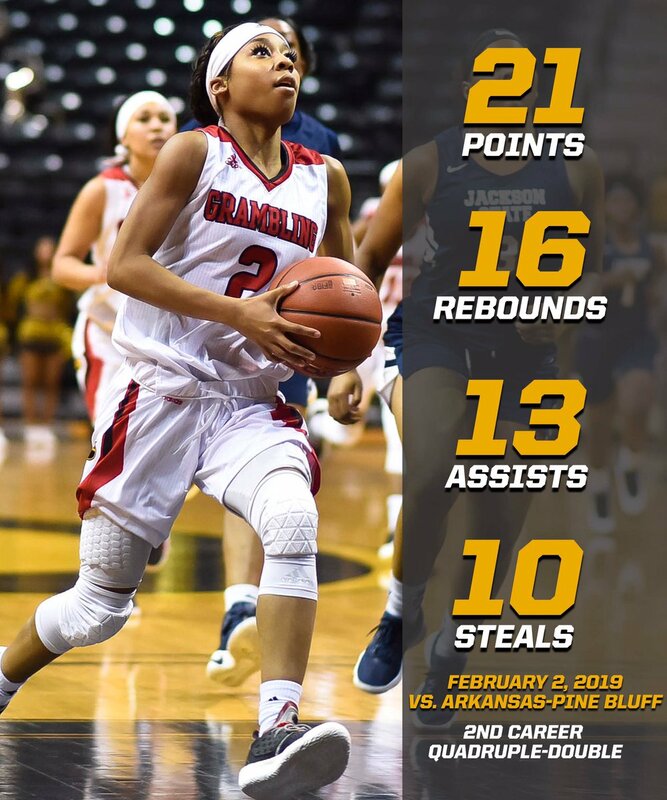 Aiya El Hassan led Arkansas-Pine Bluff (4-11 overall, 1-7 SWAC) with 14 points, eight rebounds, two assists and one steal. Atitiana Vincent and Noe’ll Taylor each added 10 points. Grambling State (9-11, 6-2) trailed for most of the opening quarter, but grabbed the lead with 59 seconds left when Shakyla Hill sank a pair at the foul line and the Lady Tigers took a 16-12 lead, after Ariel Williams sank a half-court buzzer beater, into the second period. GSU opened the second quarter on a 12-4 run, capped by a Jasmine Forte bucket with 6:31 remaining. Arkansas-Pine Bluff cut the deficit to 34-25 after a putback by Aiya El Hassan with eight seconds left, but Justice Coleman’s layup as time expired gave Grambling State a 36-25 halftime lead. The Lady Lions closed the gap to 36-28 after a 3-pointer by Atitiana Vincent with 9:25 left in the third, but that would be as close as UAPB would get. The Lady Tigers outscored Arkansas-Pine Bluff, 22-15, and took a 58-40 advantage into the final quarter. Grambling State concludes its three-game homestand on Monday as Mississippi Valley State comes to town. Tip-off against the Devilettes is set for 5 p.m. This entry was posted in athletics, events, gramstory, press release on February 4, 2019 by Jovan Hackley.